A bridal portrait featuring the details of the brides outfit including the delicate strapless back of the off-white gown as well as the white florals of the wedding bouquet which compliment the floral pattern in the wedding dress. Isn't she just stunning! 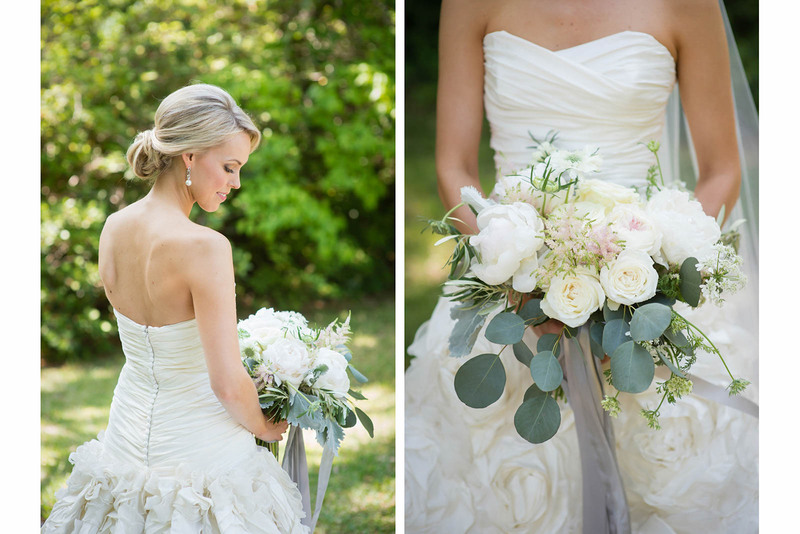 This bride had an incredible delicate strapless off-white gown. This gown had details of ruffles on the bust with small buttons down the back and a ballgown bottom with rose ruffles incorporated in the fabric. She wore stunning but simple pearl earrings and her bouquet complemented her dress with white roses and hints of pink in the flowers as well with a crown of leaves around the flowers and a purple ribbon to tie it all off. These colors were so simple but also so classy and elegant, just like the bride in this bridal portrate.